Gold medal match will be broadcast by TV Asahi and AYM Sports' internetv.tv. MIYAZAKI, Japan -- World No. 1 Japan and No. 2 USA will meet Sunday in the gold-medal showdown of the ENEOS Presents VI Women's Baseball World Cup -- the world's premier global platform for elite female baseball players. The world championship grand finale is scheduled to be played on Sunday, 07-September at 14:00 (GMT + 09:00). Broadcast coverage of the Women's World Baseball Cup will continue through to the gold medal match in Japan via TV Asahi, and to audiences worldwide as free content at internetv.tv, as part of WBSC's partnership with AYM Sports. Due to the demand and interest being generated from the women's baseball showcase, in-game commentary at internetv.tv has been expanded to three languages: English, Japanese and Spanish. In addition to the broadcast coverage of the 2014 Women's Baseball World Cup, this year's event -- and women's sport, in general -- has been boosted by the backing of Japan's largest oil company, Tokyo-based JX Nippon Oil & Energy Corp, whose "ENEOS" brand has several successful partnerships across motor sports, including high-profile sponsorships for Formula One and NASCAR racing teams. The ENEOS Presents VI Women's Baseball World Cup successfully kicked off Monday in front of a record crowd of 14,500 spectators at Sun Marine Stadium and TV Asahi's nationally televised/AYM Sports global online audience. Following the opening round-robin, three-time defending champions Japan and two-time world champions United States have eliminated the competition in the eight-nation event, setting up a highly anticipated rematch of the 2012 V Women's World Cup finale that took place in Edmonton, Canada. 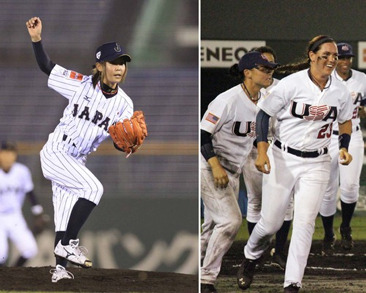 The eight-nation 2014 Women's Baseball World Cup started out with National Teams of Australia, Canada, Chinese Taipei, Hong Kong, three-time defending champion Japan, Netherlands, United States and Venezuela. On Friday's first Final Four contest, USA defeated T-No. 3 Australia, by a score of 3-1, in an exciting, fast-paced and well-defensed pitcher's duel that lasted just over two hours. In Friday's other Final Four match, Japan KO'd Canada, 12-2, causing the game to end after five-innings and extending "Madonna Japan's" win streak to 12 games, dating back to Edmonton. A total of twenty-four Women's Baseball World Cup games are being contested in Miyazaki to determine the 2014 world champion. In addition to the continued worldwide emergence of baseball and softball as one of the biggest sports movements in the world -- now being played competitively by youth and men and women in over 140 countries -- the performance of Japan's national women's baseball team in Miyazaki has further pushed interest and broadcast numbers in Japan, highlighting significant and unique opportunities for baseball and softball to contribute to the Tokyo 2020 Olympic Games, the two most popular sports in the Olympic host nation. Support and hope continues to build amongst baseball and softball's more than 65 million international athletes at all levels of competition and among stakeholders and global fan base, for the bat-and-ball sports to be considered for possible Olympic Games inclusion by the IOC at a special session in Monaco that will discuss new options for the Olympic Games sport selection process in December. The next (VII) Women's Baseball World Cup will be celebrated in 2016 and hosted by another baseball/softball nation, South Korea, where the global women's baseball showcase will be expanded from eight to twelve participating nations, in order to keep up with the global development and widening commercial interest.